Just because I am a journalist doesn't mean I cannot be a sports fan. I have not only covered numerous sporting events, but grew up watching them as well. 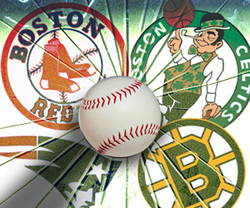 To tell YOU (the reader, or fan of Shawn Hansen if there is such a thing) I am an avid fan of the Boston Red Sox, and Celtics. I am not too big into the game of football, but will watch the New England Patriots. I am not a hockey fan at all (sorry all you hockey enthusiasts) but I will watch them if they make the Stanley Cup. There was a picture I could have used instead of the picture I chose with the four main Boston sports teams, but I chose this picture because watching paint dry is more exciting then watching soccer. Shaquille O'Neal was my favorite basketball player HANDS DOWN. Watching O'Neal since he started his career with the Orlando Magic, I was a Magic fan from 1992-96, Los Angeles Lakers fan from 1996-2004, Miami Heat fan from 2004-08, Phoenix Suns fan from 2007-09, Cleveland Cavaliers fan from 2009-2010. When O'Neal came played with the Celtics in the 2010-11 season it was the most amazing thing because he as I said was my favorite all time player. That and the fact that my all time favorite three-point shooter Ray Allen was on the team. To make things clear the Celtics have always been my NUMBER ONE team. From 1992-2010 I was only a fan of the teams I mentioned because O'Neal was on those teams. Ray Allen - The BEST three-point shooter in the History of the NBA! Starting his career off with the Milwaukee Bucks (1996-2003), Allen also played for the Seattle Supersonics (2002-07), CELTICS (2007-2012), and the Miami Heat (2012-present). Being my FAVORITE three-point shooter since he was with Milwaukee, Allen had 1,051 threes with the Bucks, 869 with the Supersonics, 798 with the Celtics, and 139 with the Heat for a career record of 2,857 three-pointers in the regular season. Looking back on Allen's career, The King of Three-Pointers had a career low of 74 treys with the Bucks in the 1998-99 season, and a career high of 269 in the 2005-06 season with the Supersonics. In the playoffs Sugar Ray sunk 76 shots from beyond the arc with Milwaukee, 31 with Seattle, 206 with the Celtics, and 13 currently with Miami for a grand total of 326 triple point shots. Reggie Miller (2nd place in three-pointers) had 2,560 career three-pointers in the regular season along with 320 playoff three's, and 5 All Star three-pointers. ... Allen has beat all of Millers records. Allen's 269 three-pointers in a single season beat Millers 229 (1996-97) by 40-threes. Millers low was 61 in 1987-88 as Allen's was only 74. 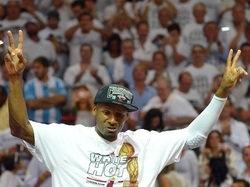 So - Ray Allen won his second NBA Championship as a member of the Miami Heat and not the Boston Celtics. People may say he shouldn't have left the Celtics, and was unfaithful to the team because he left, but he left the Celtics for the Heat to play in 2012-13 for his own reasons. The GREATEST Three-Point Shooter Alive now has TWO RINGS. .... Congratulations Sugar Ray! Remember the Big-Three of 2007-12? I don't care if Kevin Garnett, Ray Allen, and Paul Pierce weren't the "Original Big-Three" of Larry Bird, Robert Parish, and Kevin McHale, these three were a phenomenal asset to the Celtics, and their 2008 NBA Championship! THE CHAMPIONSHIP YEAR of 2007-2008. The End of an Era - July 12, 2013 - Call it "The Departure" but that's a movies name. Ray Allen as everyone knows left the Celtics to play with the Miami Heat for the 2012-13 season, in which they won the NBA Championship. ... He signed a deal to play with the Heat for another year (but that's a different story). Paul Pierce (who spent his 15-year NBA career with the Celtics) and Kevin Garnett (who spent six-years in Green) have been traded to the Brooklyn Nets in exchange of Gerald Wallace, Kris Humphries, Keith Bogans, MarShon Brooks, Kris Joseph, three future first round draft picks along with the option to swap first round draft picks during the 2017 draft. PIERCE: Playing in a total of 1,102 regular season games "The Truth" as he was respectively nicknamed by the great Shaquille O'Neal scored 24,021 points knocking home 1,823 three-pointers, 6,434 free throws as he blocked 668 shots, and picked up 1,583 steals. In the playoffs, #34 (whose number will eventually be retired) scored 2,843 points draining 219 three-pointers, and 816 free throws stealing 180 passes and blocking 94 shots all in 136 playoff games. KG: Playing in a total of 396 regular season games after playing with the Minnesota Timberwolves for 12-years "The Big Ticket" scored 6,233 points knocking home nine three-pointers, 1,072 free throws as he blocked 394 shots, and picked up 460 steals. In the playoffs, the man who chanted "Anything is possible" when winning the 2008 NBA Championship scored 1,469 points draining three three-pointers, and 244 free throws stealing 106 passes and blocking 93 shots all in 84 Celtic playoff games. BEFORE the RED SOX -- Papi played for the Minnesota Twins from 1997-2002. In the coarse of six-years as a Twin, Ortiz (who wore #27 back then) played in 455 games belting 58 home runs, 238 RBI, 108 doubles, and three triples all on 393 hits going to the plate 1,477 times. Playing in 1,452 games through July 12, 2013, Ortiz has polished off 362 home runs, 1,153 RBI, 396 doubles, and 15 triples all on 1,560 taking 5,341 at bats. Ortiz (not known for his speed) has stole 10 bases on 16 attempts in his Red Sox career. ... With the Twins he stole four out of six bases. Ortiz passed Harold Baines on Thursday, July 11, 2013 against the Seattle Mariners as the new King of Designated Hitter Hits with 1,689 hits. Going into the game, Papi acted fast to pass Baines as he smacked a second inning double to left center off of Aaron Harang. Harold Baines played from 1980-2001 mainly for the Chicago White Sox (14-years) but also played for four other teams including the Baltimore Orioles (seven-years), Oakland Athletics (three-years), Texas Rangers (two-years), and the Cleveland Indians for one-year. Papi (who is still adding up his numbers) has played for the Twins & Red Sox from 1997-present.